Attack on Titan is a popular manga series that first came out on September 9, 2009. With the popularity of this anime, the light novel, video game and animation series related with it had appeared gradually. This anime is about the fight of humans against the Titans, which are giant humanoids. Until the present time, the first season has finished with great success while the new episodes are still being released. We all know that the animation had not yet aired in other countries. However, even if it is not being shown in your location, you can still watch the series online. There are sites where episodes of the anime series are posted. One of the sites where you can watch these episodes is the popular video sharing site YouTube. There are also several other sites where you can view Attack on Titan, especially those that specialize on streaming anime series like animeonhand.com. Watching episodes requires you to connect to internet constantly, so if you wish to watch it at a later time or bring it with your portable player, you may wish to download Attack on Titan episodes so you can view them at a later time. In doing so, you can save yourself from video buffering, which can be frustrating when watching online. First, let’s go through the process on how you can download the episodes for Attack on Titan via YouTube. But before doing so, let me remind you that you may not be able to find a full length episode of the series. Most of them are video clips or segments that are divided into several parts. 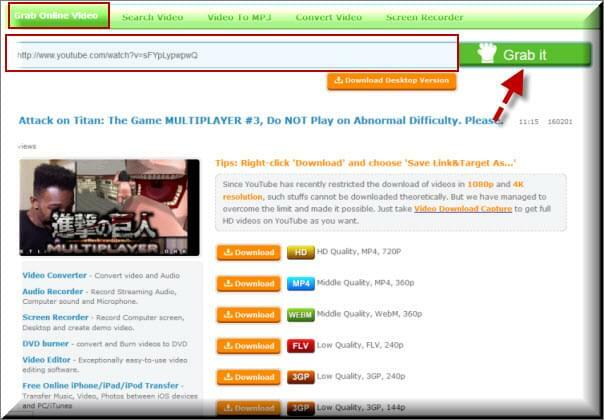 This method is using an online downloader provided by us, you can use this web app for a quick solution. This is an online tool that you can use to free download Attack on Titan. It is an online application so it doesn’t require installation. Using it is simple as you just have to get the URL of the video on YouTube, paste it on the URL field of Video Grabber and click “Grab It” button. Enable the Java applet and click download next to the format you prefer. Wait for the download to complete and you have the video saved on your computer. The second method we have is to let you view and download full length episodes of Attack on Titan. It lets you download more complete video clips from a professional anime site which is not supported by other applications. Animeonhand.com is a site where anime lovers can watch a huge list of various anime titles with their full episodes, including Attack on Titan. The best tool to use for this is Video Download Capture. 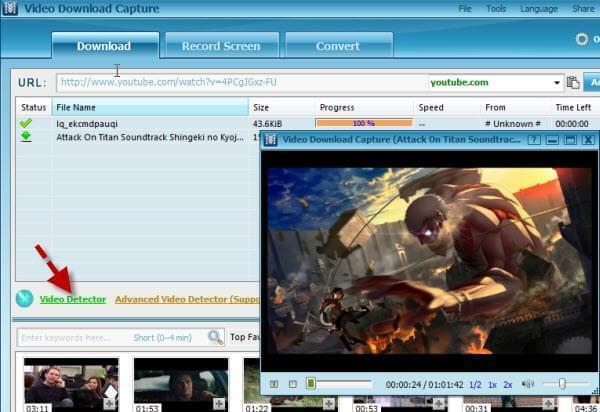 Video Download Capture is a powerful application that can be installed on your computer. It can download Attack on Titan episodes and other videos that you find online. Moreover, it can even download videos streamed from other servers, which is something that other video download applications do not support. Aside from downloading videos, it can also record your screen, as well as convert videos to different audio and video formats. 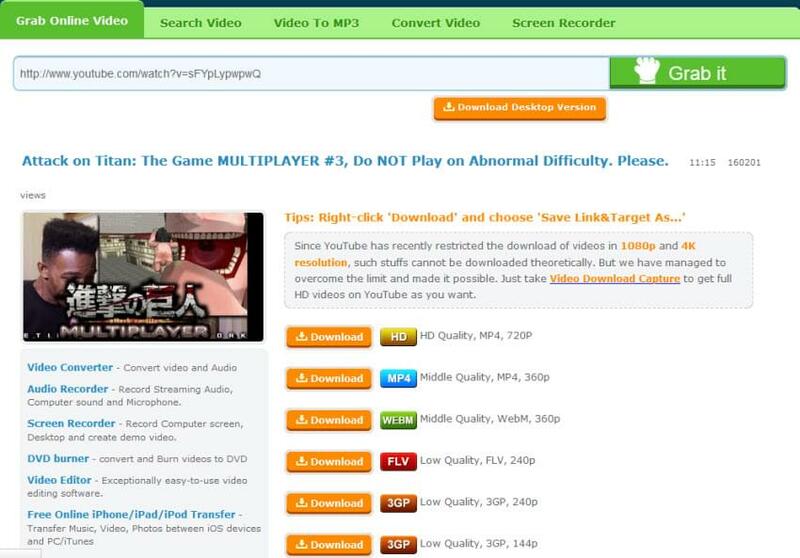 Here’s how to download full length episodes of Attack on Titan using this software. Download the program by clicking on the green download button. Wait for the download to complete so you can proceed with the installation. Once done with the download, go to the downloaded file and double click it to start installing the program. Tips: After installation, you simply launch the program. “Video Detector” rested at the lower left side of the program is activated by default. This will automatically detect any video that you play online. Go to “Animeonhand.com”, type “Attack on Titan” on the search field and hit the enter key on your keyboard. The search result will show you a list of full length Attack on Titan episodes that you can view and download. Click on the first video you wish to download and Video Download Capture will automatically detect it and it will start Attack on Titan free download. To add as many clips as you need to the download list. This video demo will give easy and detailed steps. Video Download Capture does not just let you download Attack on Titan with English subtitles, but it also allows you to add subtitles on the videos. That is to say, you are able to watch Attack on Titan with other language subtitles. To do this, click on the “Convert” tab, add or select the video that you wish to use and click “edit video”. Select “subtitle”, choose “enable subtitle” and next to plug-in, import the subtitle that you wish to use that is saved on your computer. Adjust the font style and size, as well as the position according to your preference. Click “OK” once done. Video Download Capture supports common subtitle formats so you would not have problems adding one to your video.